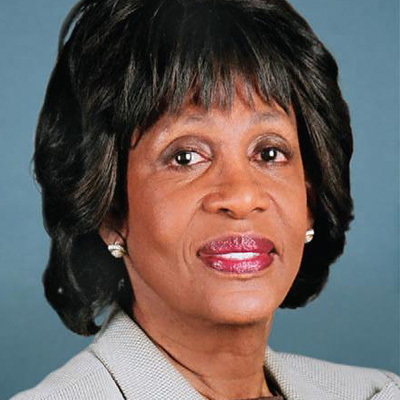 Elected in November 2008 to her tenth term in the House of Representatives with an overwhelming 80 percent of the votes in the 35th District of California, Congresswoman Maxine Waters represents a large part of South Central Los Angeles, the communities of Westchester and Playa Del Rey as well as the diverse cities of Gardena, Hawthorne, Inglewood and Lawndale. She continues to be a member of the House Committee on Financial Services and the Chairwoman of its Subcommittee on Housing and Community Opportunity. She also serves on the Subcommittee on Financial Institutions and Consumer Credit, and the Subcommittee on International Monetary Policy, Trade and Technology. She also continues to serve on the Committee on the Judiciary and its Subcommittee on Crime, Terrorism, and Homeland Security and its Subcommittee on Immigration.